I'm writing this late because I fell into the trigonometry trap left by my daughter. Never again. So, as I write, the Royals are leading the A's 3-2, but that could all change and everything that I write from here on out may be obsolete in an hour or two. Oh, well. How often do I get to write about the Royals? 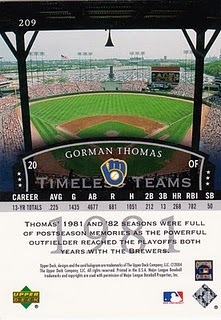 The best thing about Kansas City playing a playoff game is it evokes memories of what I call my first collecting era. That era runs basically from the mid-1970s to the mid-1980s. Or, in other words, the same period of time that the Royals were winning playoff games and playing in the World Series. My glory card years were their glory years period. 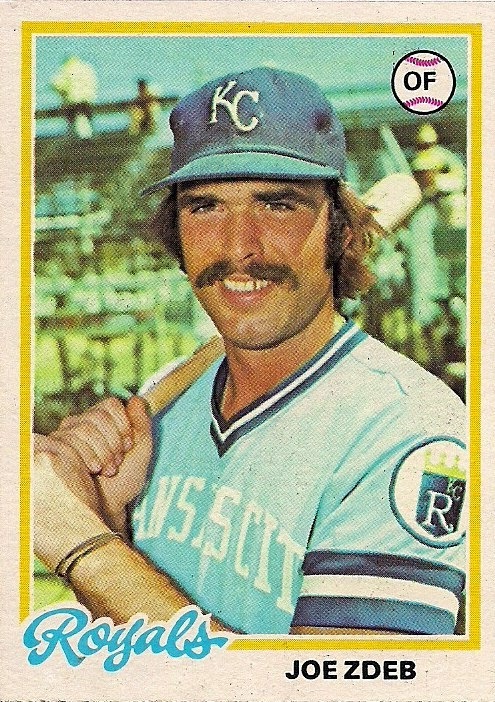 So I wanted to show some Royals card favorites from that period -- I kept it to 1976-85 since that is when K.C. began and ended its postseason run -- in recognition of this feat from what has always been one of my favorite teams. 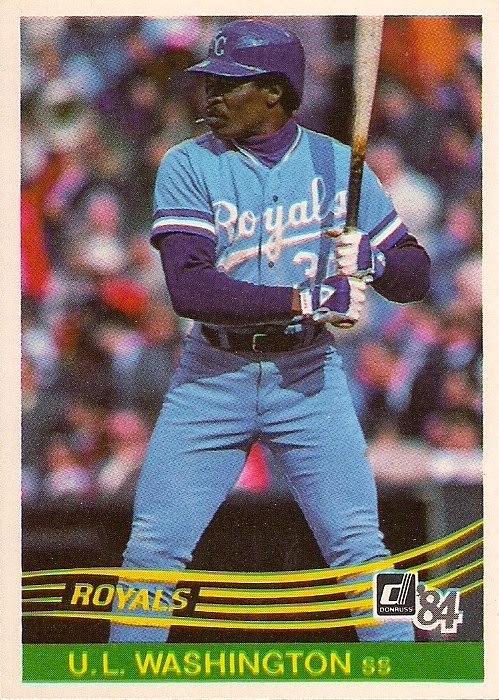 The trouble is, I've actually shown a lot of Royals cards from this time period already. And I don't want show them again. So, you won't see any Hal McRae cards here. 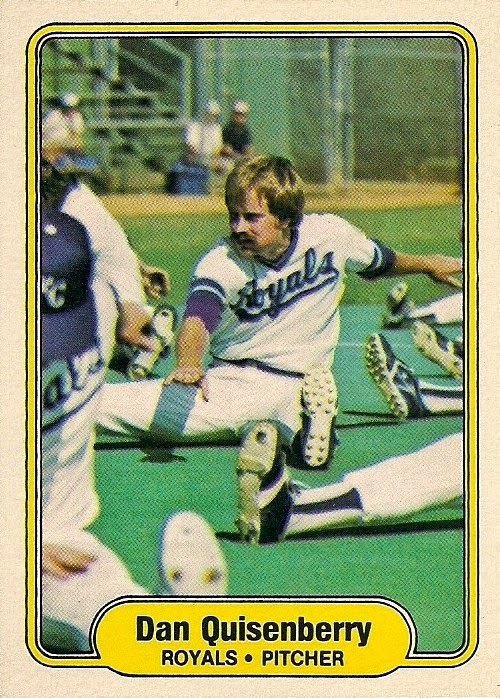 You won't see Cesar Geronimo's magnificent mustache or the Dan Quisenberry card that makes me think of my ex-girlfriend. 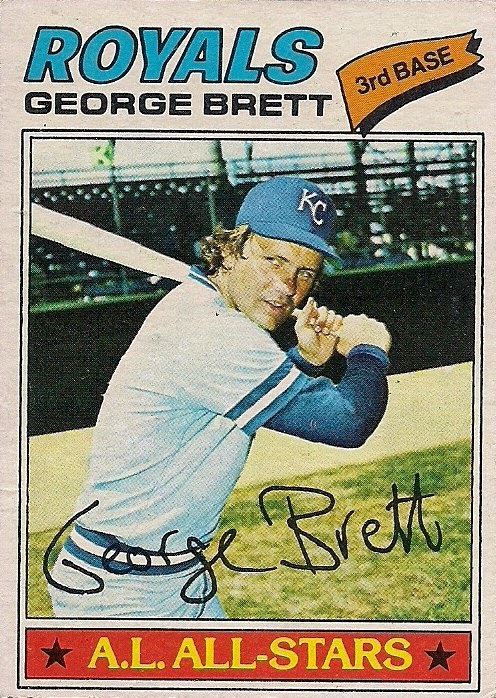 You won't see 1978 All-Star George Brett or 1980 All-Star Frank White. But, don't worry, I got you covered. I have a lot of cards. Now that I've scanned the card, I can see lots of interesting activity in the stands. 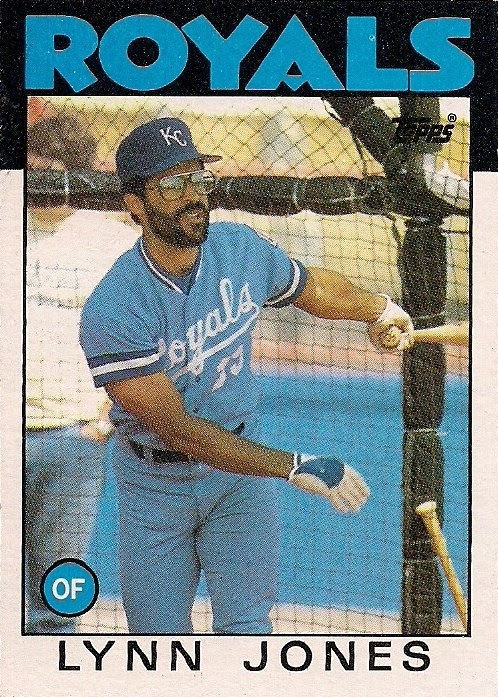 But, by far, the best part is how awed the Royals player -- Willie Wilson, maybe? -- appears to be by Wathan. Wilson is a gargantuan beast as Wilson cowers in fear. 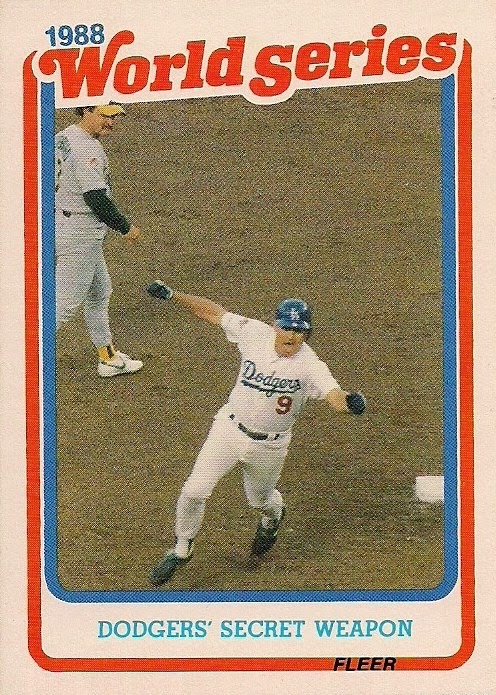 Before Sports Illustrated unleashed Sid Finch and Topps issued the Kazuo Uzuki card, my brother and I thought this was the first prank of the non-existent ballplayer. Zdeb? Zzzzz-DEB? What is that name? That's not real! It turned out the "d" is silent and we spat all over each other for nothing. 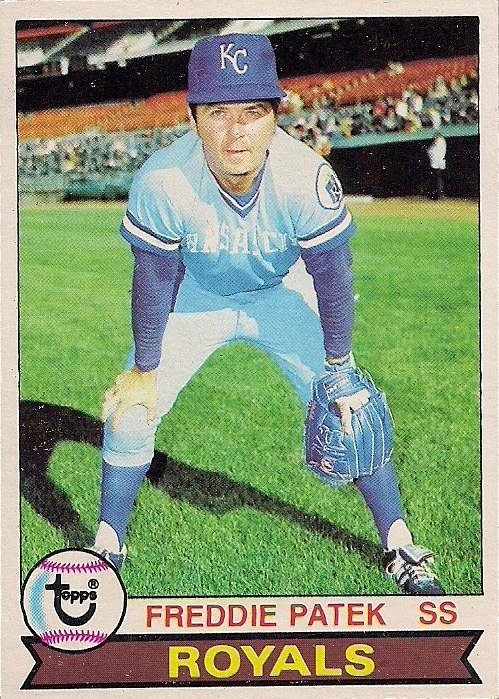 And we were relieved when the 1979 Topps set came out and Zdeb was there again. 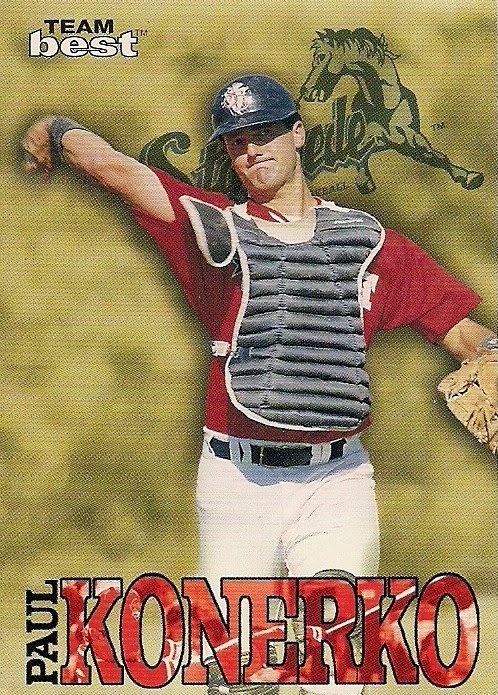 I've always liked real people on my baseball cards. A spectacular card and possibly the first ever to feature mass calisthenics. 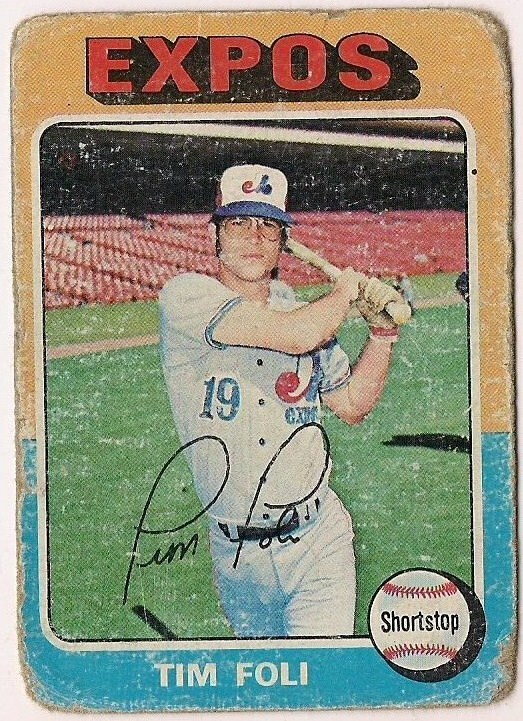 By now we knew that Fleer was on to something strange and wonderful. I was blissfully unaware of the height of ballplayers when I was a kid. 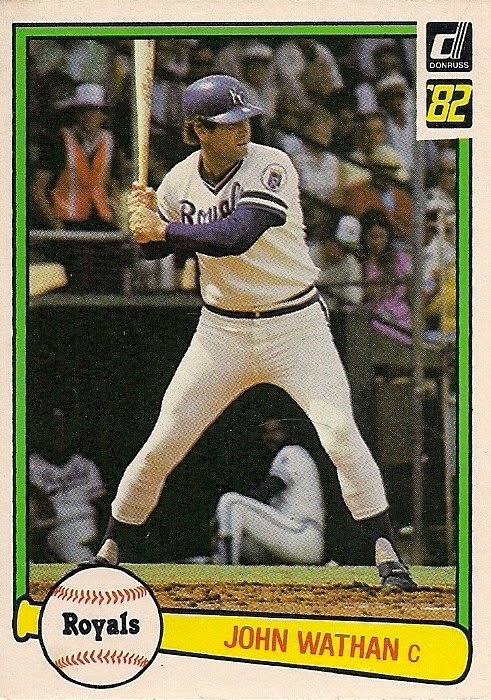 Tall guys looked short on baseball cards. Short guys looked tall. But I knew Freddie Patek's height. You don't play baseball at 5-foot-4 and keep it quiet. And if you're 5-foot-4, then the blue glove you're wearing definitely looks like a toy. MORE exercise? 1982 happened to be the same year that Jane Fonda released her first workout video. I smell cross-promotion. 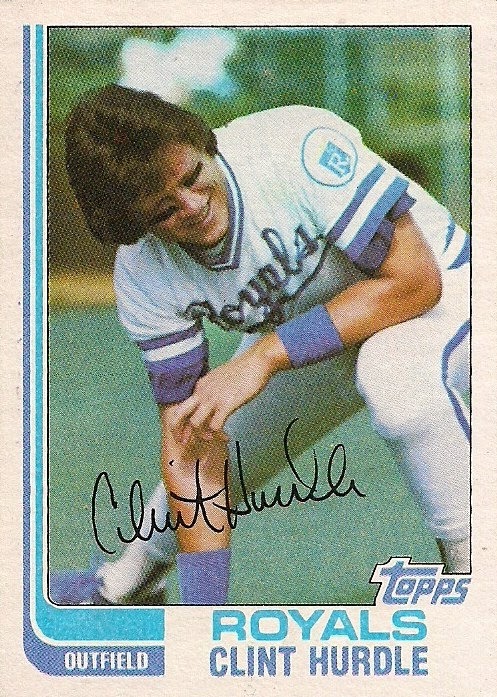 This card also somewhat answered my question of what Dorothy Hamill would look like in eye black. What this card meant to my sixth-grade class I can't even describe to you. Brett was a god at this time. A young, virile sensation. It pains me now to see some younger folks laugh at his outspoken behavior -- particular the famed pooping incident. I wish I had that kind of presence and ability to be able to broadcast my bathroom mistakes to the world without any hesitation. Let's see Mike Trout do that. This is what would happen if your chemistry teacher somehow got lost in a batting cage. 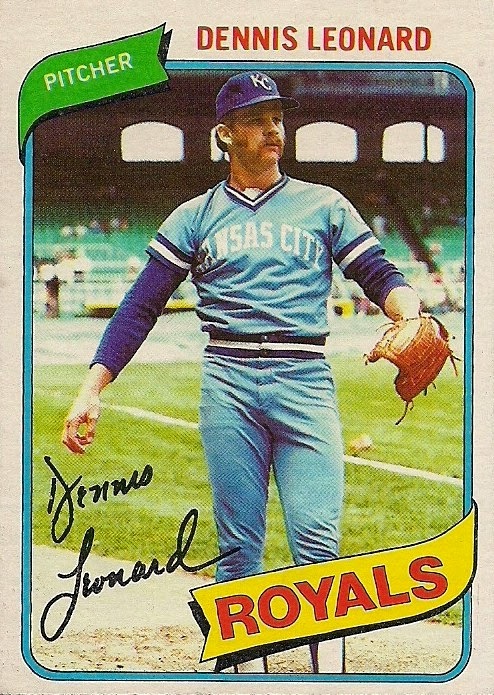 I have wondered what Leonard is doing on this card ever since 1980. He has to be mocking someone, right? Please say he is. A fan probably. An umpire would be most awesome. Or maybe his coach. Leonard is the first pitcher I ever saw win a game in person. He beat the Yankees. So he automatically rules. I say he's mocking the Yankees. Fat asses. "Revenge Of The Nerds" also came out in 1984. 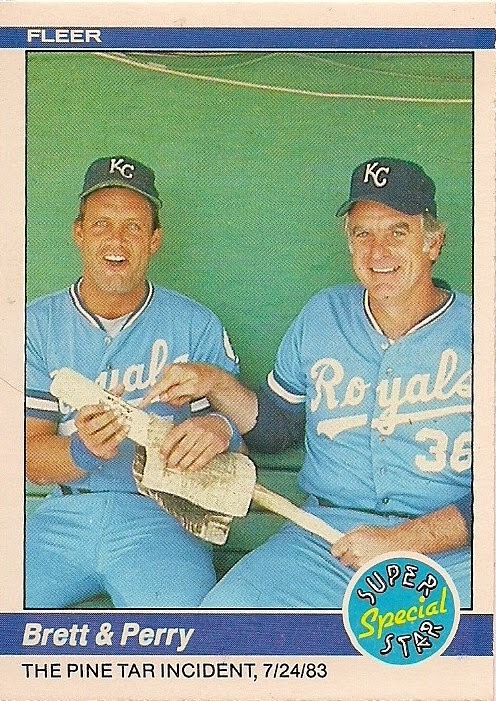 There are a lot of memorable characters in the Royals' relatively brief history. It's one of the reasons why they've always been one of the teams I've rooted for when I'm not rooting for the Dodgers. But U.L. Washington might be the best character. 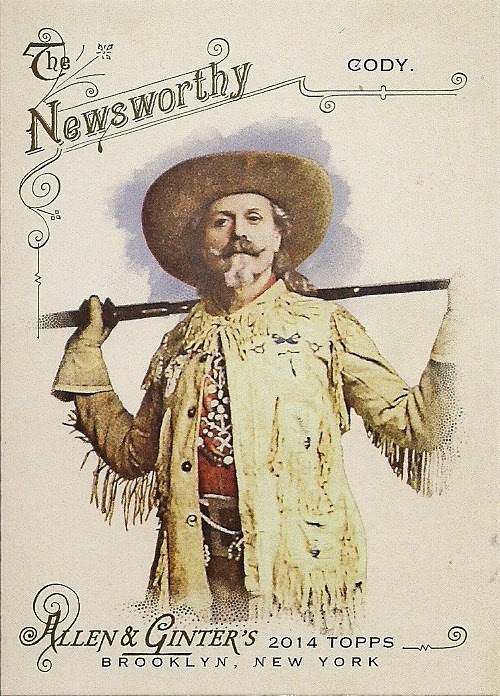 The fact that he always displayed a toothpick was endlessly fascinating to us, no matter how often it was mentioned. 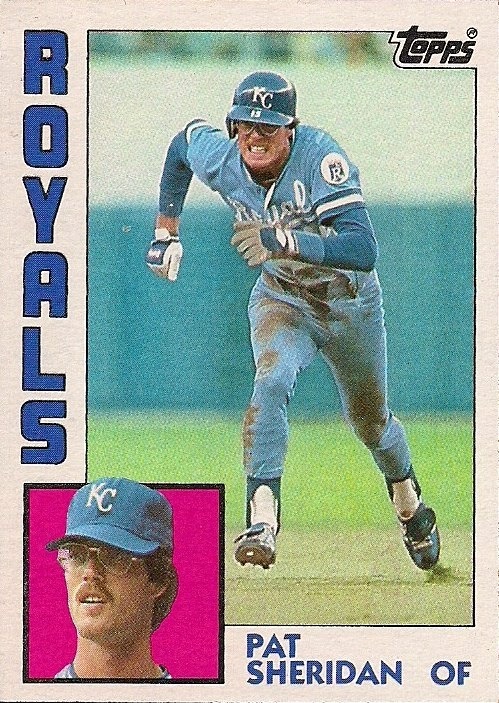 And this is one of the few cards where you can see that toothpick in his mouth WHILE HE'S PLAYING. Those are just a few of my favorites from that era. Trust me, there are many others. But I probably should watch the rest of this game instead of trying to peak views of it in between words. The Royals are now trailing 5-3. I received a care package from Commish Bob at The Five Tool Collector a couple of weeks ago. I think he's giddy about the O's being in the playoffs because with the exception of Andre here and a couple of others, the package was filled with oddballs! 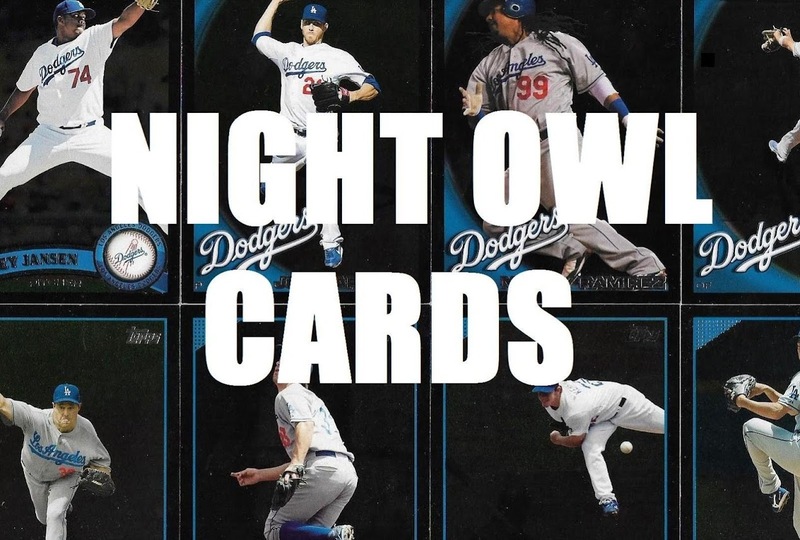 It's a Korean night card! Woooooo! Please don't make me tell you more than that the card is from 2010. I have no time for research today. 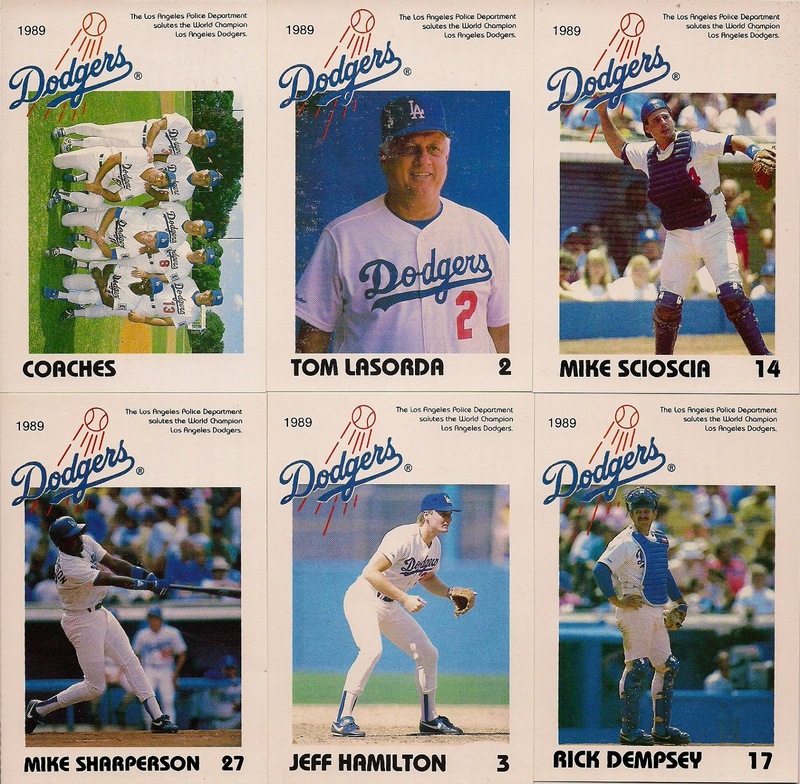 Also included was the 1989 Dodgers Police set, which is one of the team's police sets for which I didn't have a representative. Now I've got the whole thing! 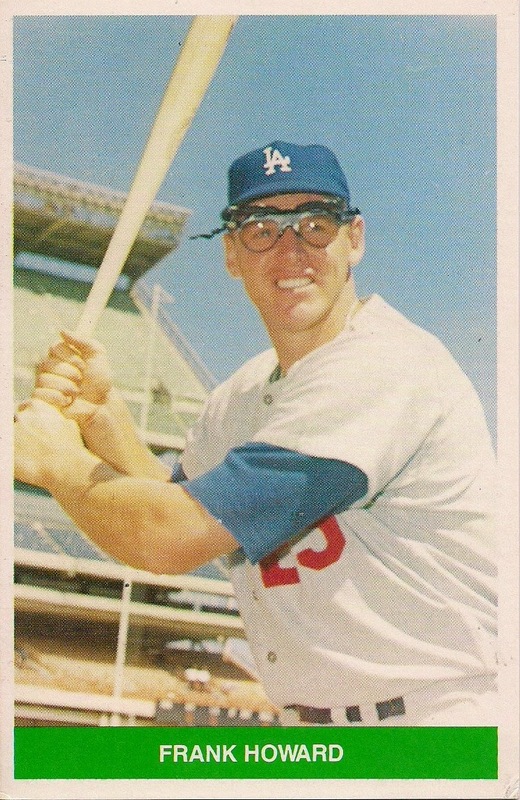 This set, of course, is important because it came out the year after the Dodgers won the World Series. 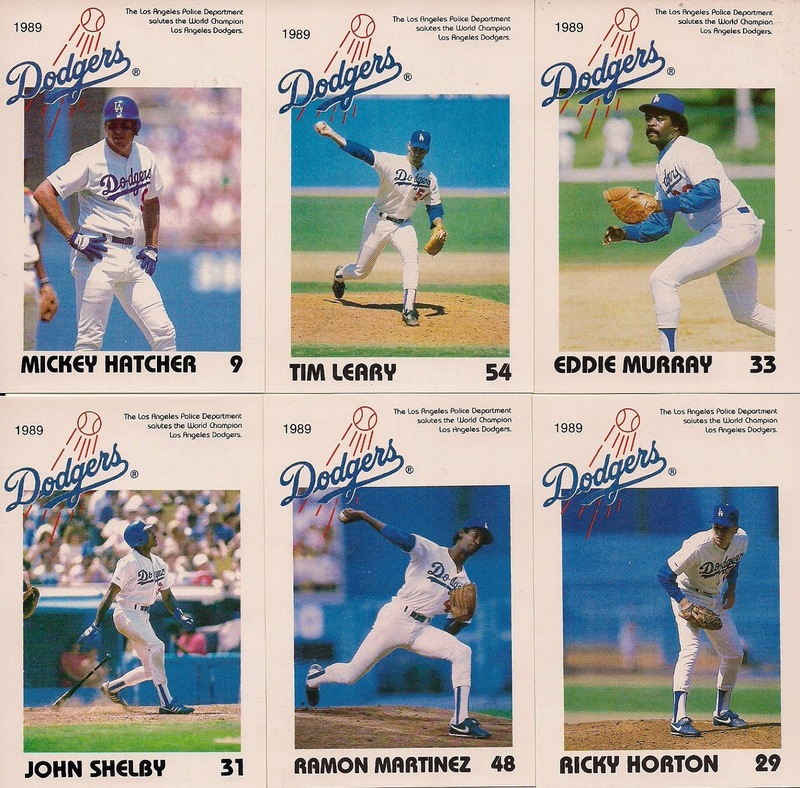 So most of your favorite 1988 Dodgers are included. 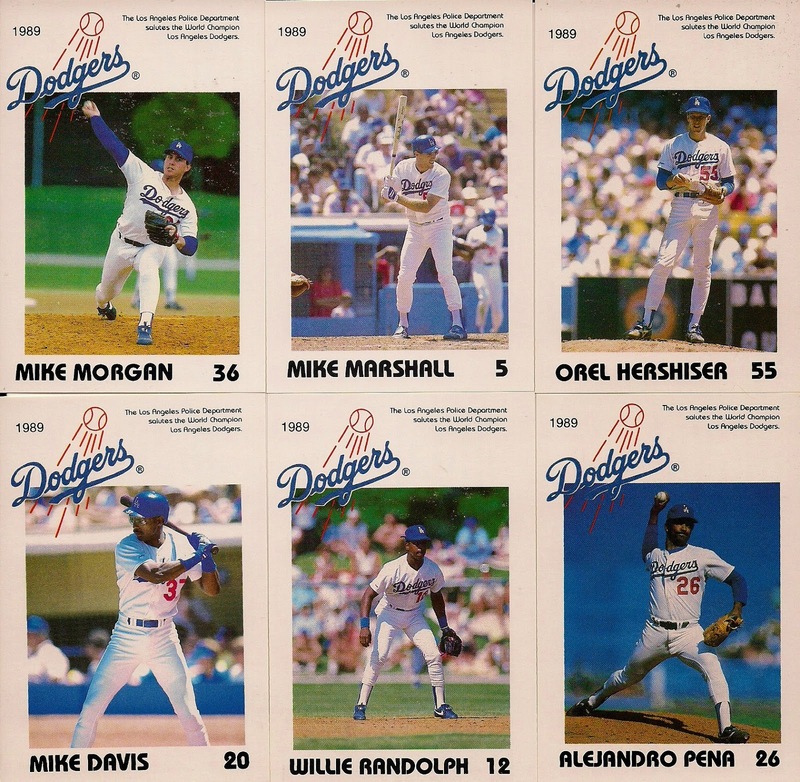 But since it came out in 1989, it tried to reflect the '89 Dodgers as much as possible. 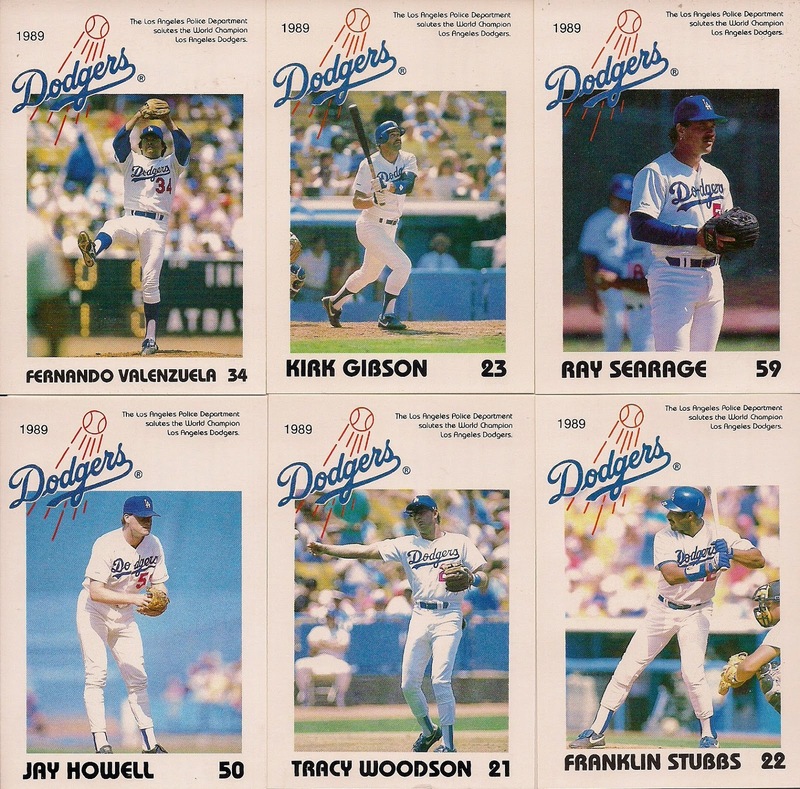 That's why there's a Willie Randolph card but not a Steve Sax card, because the '88 L.A. second baseman Sax departed. This set fills a hole in my collection, but it wasn't the best part of the package. This was the best part of the package. 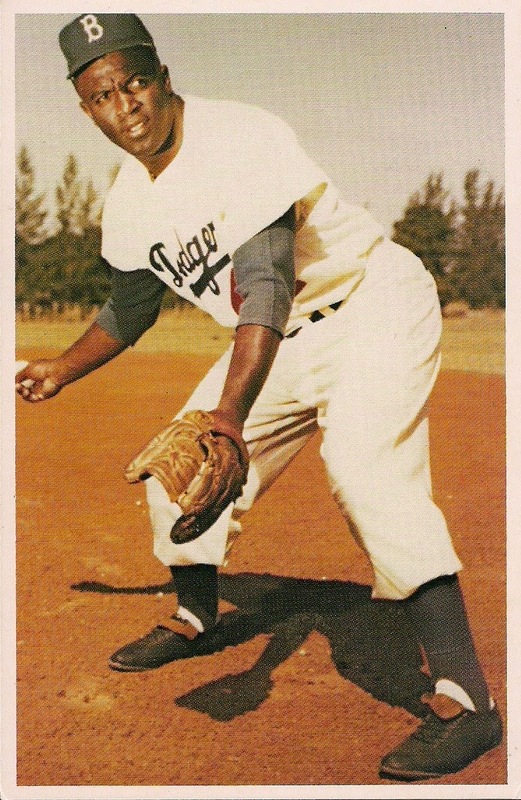 Oh, I know you've seen this Jackie photo at least on 100 other cards. But have you seen it this big? That gives you the idea of the size. They're postcard-sized cards, maybe even a little larger, and they're from TCMA, issued in 1982. I had no idea that TCMA produced cards this large. I guess I was too focused on items that were 2 1/2-by-3 1/2 when I was a kid and TCMA was doing its thing. The ones with the names at the bottom are actually from 1984. I don't like those quite as much as the '82s, but it's still nice to have my '50s and '60s Dodgers heroes in almost life-size form. Plus you can't beat "he was forced to restrain the tempests of his fiery competitive spirit" for writing on the back of a baseball card. 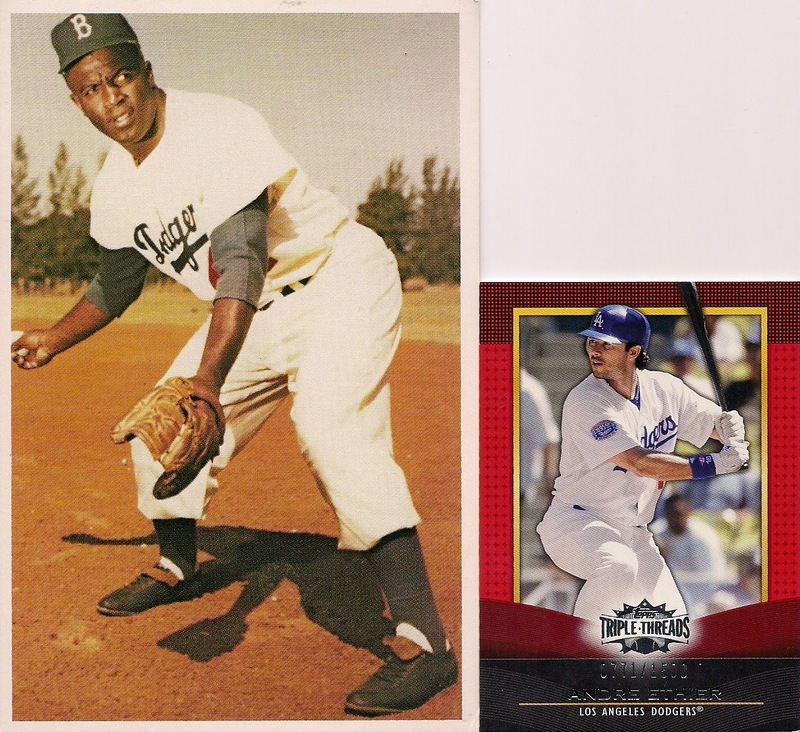 TCMA is right up there in terms of the size of giddiness I feel when acquiring baseball cards. But do these cards beat Kellogg's in terms of oddballs? Probably not. But that's only because I wasn't pulling TCMA cards out of cereal boxes. TCMA's were always stationed so far away that I had to view them in a black-and-white catalog and wait six weeks for them to arrive. But I'm telling you, if those TCMA cards were in cereal boxes ... we'd be talking an entire blog devoted to TCMA. Which reminds me, I really need to make my own cereal and then put my own baseball cards in the boxes. With just a few glaring exceptions, I like the teams headed to the playoffs this year. Taken collectively, they offer the excuse for nostalgia. In fact, when I see the playoff schedule, the Human League starts playing in my head. That's because this year's playoff grouping definitely features an '80s flavor. There is still one playoff spot undecided -- the A's or Mariners will determine that tonight or tomorrow (or Monday) -- but I can still see a team from every World Series of the 1980s, except 1986, in this year's playoffs. That's nine years out of 10, which is a better representation than any recent decade. The 1970s features six years (eight if the A's get in). The 1990s features none (one if the A's get in). The 2000s features three. This makes me happy, partly because I hated the Series matchups in the '90s, but mostly because the '80s was full of good times and the unexpected, both on the field and off, in my life and out. I think this is why the Royals are drawing so much applause for making the playoffs for the first time since 1985. People of a certain age (mine) and even younger remember the days when the Royals made the postseason virtually every year. We grew up during that time. The Royals were -- are -- supposed to be in the playoffs. During the late '80s, it felt awfully empty without K.C., and, apparently, when you don't let K.C. in the playoffs for a few years, then the '90s happen and it's the Yankees and Braves stomping their boot all over everything. So, yeah, good for the Royals. And all those other teams who were good in the '80s making it back again (mostly the Dodgers and Orioles). I'm looking forward to seeing some new blood in the World Series. Which actually is old blood. Does it make the binder? : Yes! If you don't live in New York State perhaps you missed it. Derek Jeter hit a game-winning single in his ... oh, who am I kidding, you all get ESPN, right? Suffice it to say, I think people overreacted juuuuust a little last night. But I don't have anything negative to say about Jeter. Hall of Fame player. Charmed career. Too bad he had to play for THAT team. 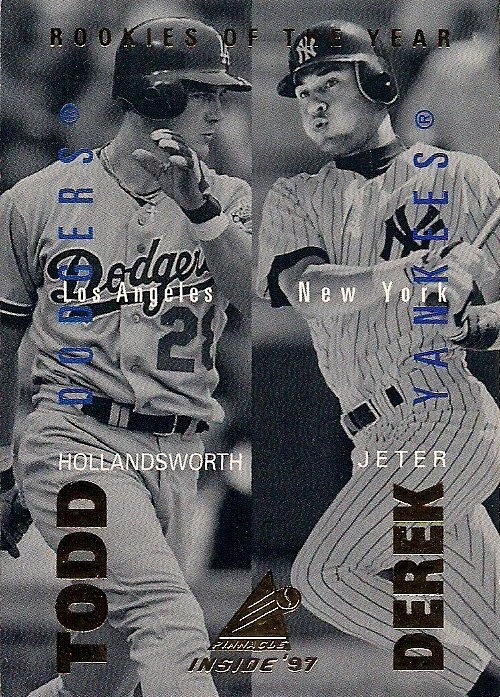 Unlike billions of collectors, Jeter doesn't fit into my collecting priorities much. 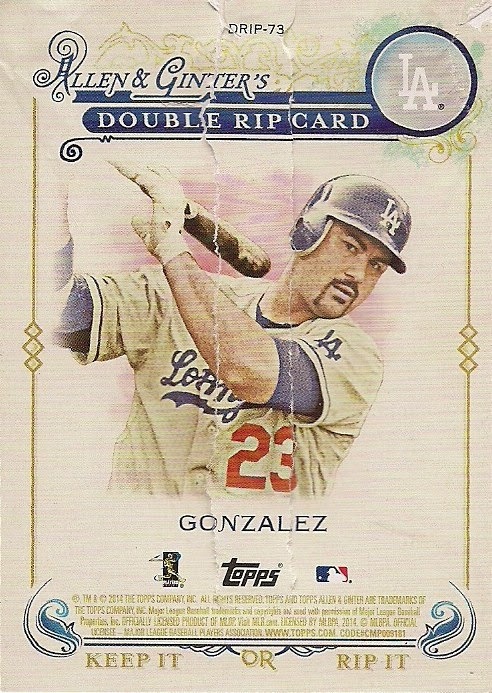 In fact, the card above is the only way he gets in any of the Dodgers binders. All other necessary Jeters are related to sets I've collected. But that other guy who is retiring in a matter of days, that first baseman for the White Sox -- the one who is a little more of my kind of player -- can be found in my binders everywhere. It's Paul Konerko Day in Chicago on Saturday. I hear they're going to run some sort of video, and then I hope Konerko goes out and blows up a light tower like Roy Hobbs and no one can ever stop talking about it. 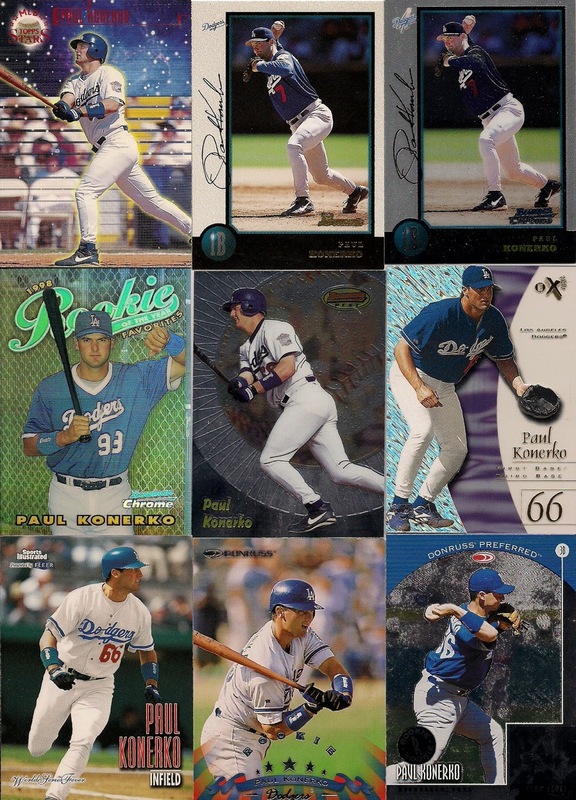 If my records are correct, I have 104 cards of Konerko. Somewhere between 65-75 of them are of him with the Dodgers, the team that drafted him. 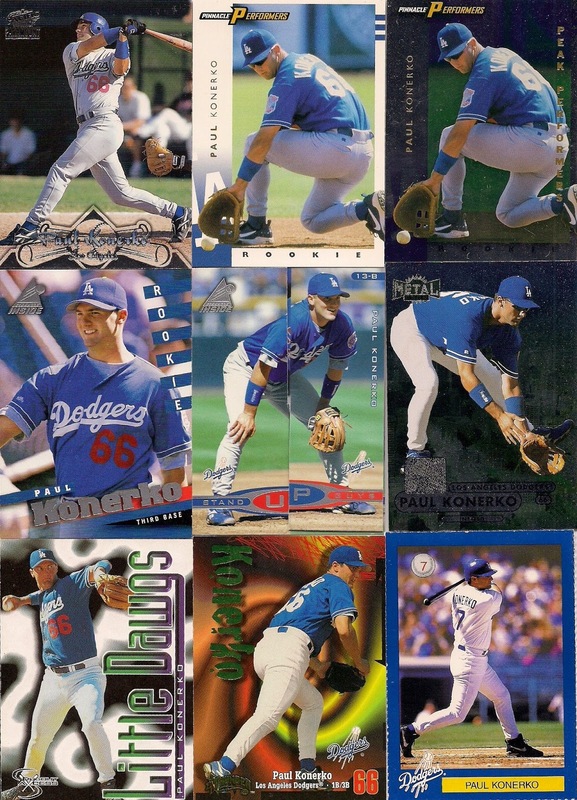 He played only 55 games for the Dodgers in his career and I have a card for every game, plus probably the 26 games he played for the Reds after he was traded to them by L.A.
A big part of why I have an attachment to Konerko is because of what could have been. If the Dodgers never traded him, they probably could have enjoyed stability at first base for years. No signing of an over-the-hill Fred McGriff. 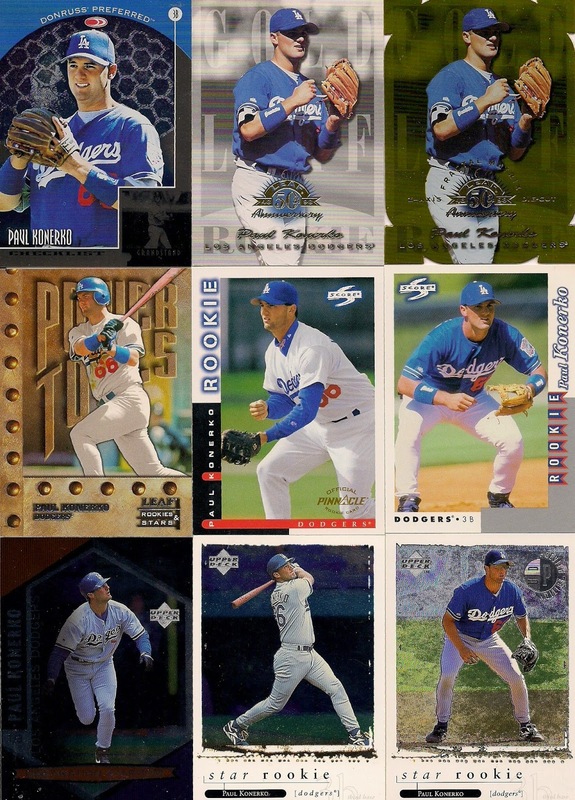 No position experiments with Shawn Green and Nomar Garciaparra. No desperate expectations with Hee-Seop Choi. No waiting seven years for James Loney to realize his potential. No giving prospect-lovers heartburn with an epic trade with Boston. So much effort that could have been conserved. 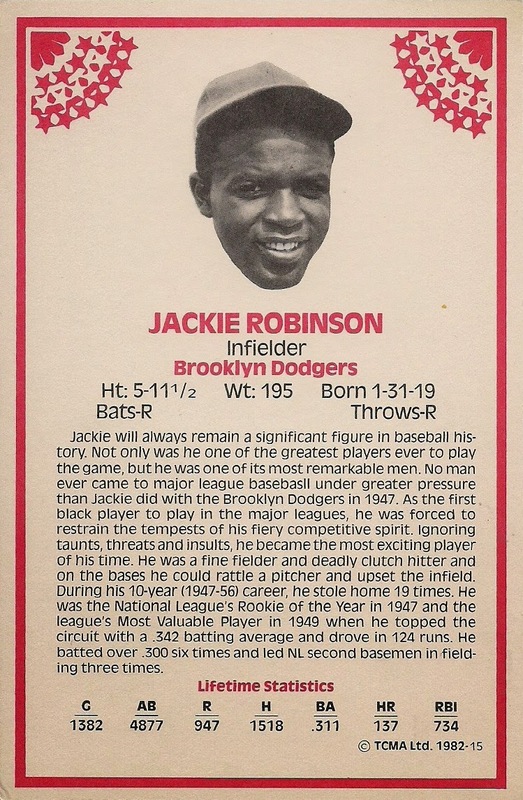 A lot of cards with the word "ROOKIE" plastered all over them. 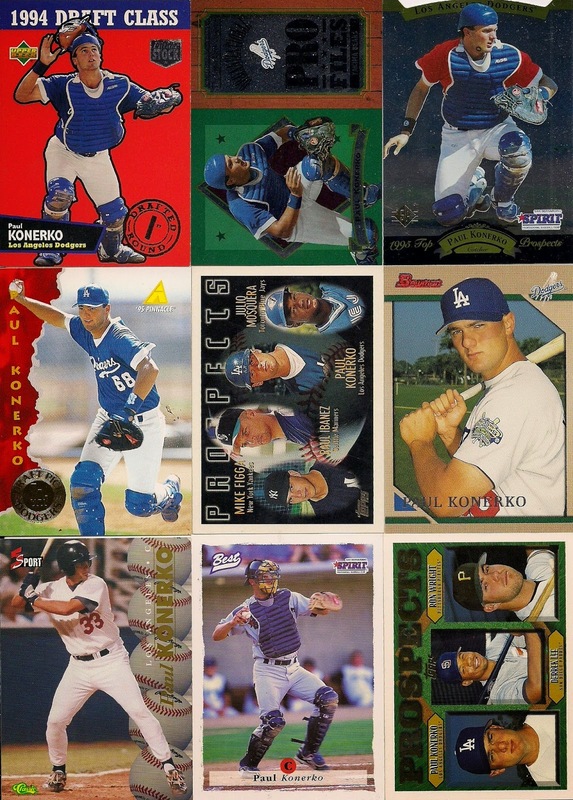 I didn't track down all of the Dodger Konerkos I have, mostly in the interest of time and sanity, since I have to put all these back in the exact order in which I removed them. 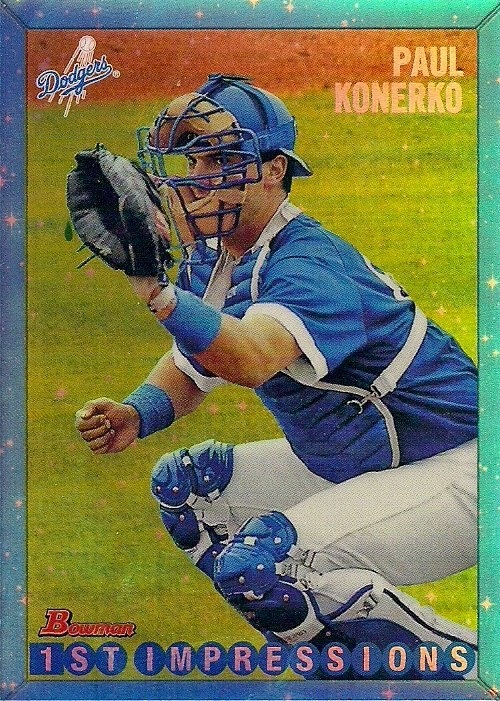 But you do get the idea that I have a decent reminder of Konerko's days as a Dodger. 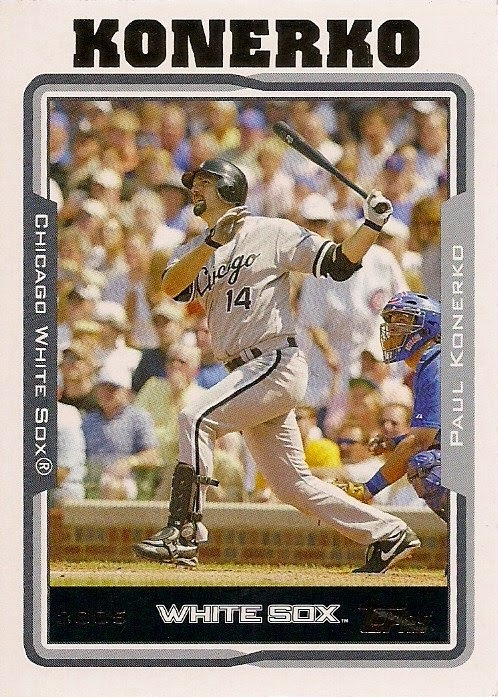 And to you White Sox fans who look at these and say "THAT isn't Konerko," you know what? Blasting the light tower in his final at-bat to win the game. I've collected cards for a long time now. But because I go at my own pace and don't attempt to grab everything from the latest and greatest, I've missed out on some things that are almost regular occurrences for other collectors. This is my first rip card. I didn't pull it -- I don't really buy boxes anymore. It was sent to me by Jeroen, The Dutch Card Guy. 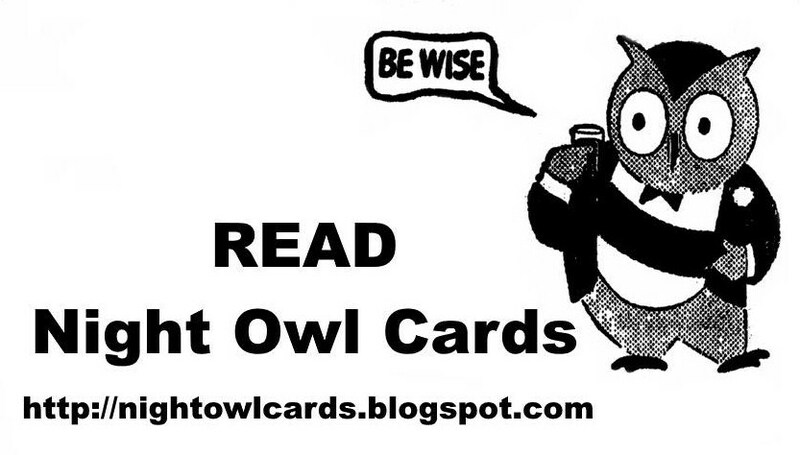 Since it's my first rip card, you must now be submitted to my very outdated and antiquated views on rip cards. 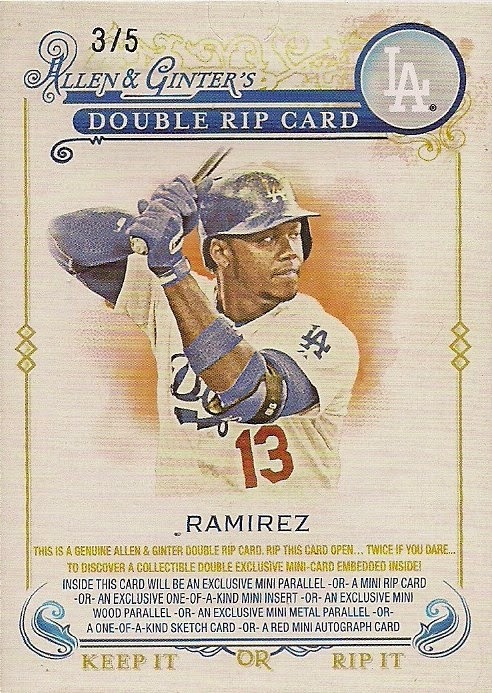 And those are: I can appreciate the intrigue created by a card like this, but I have a fundamental problem with voluntarily ripping up a baseball card. 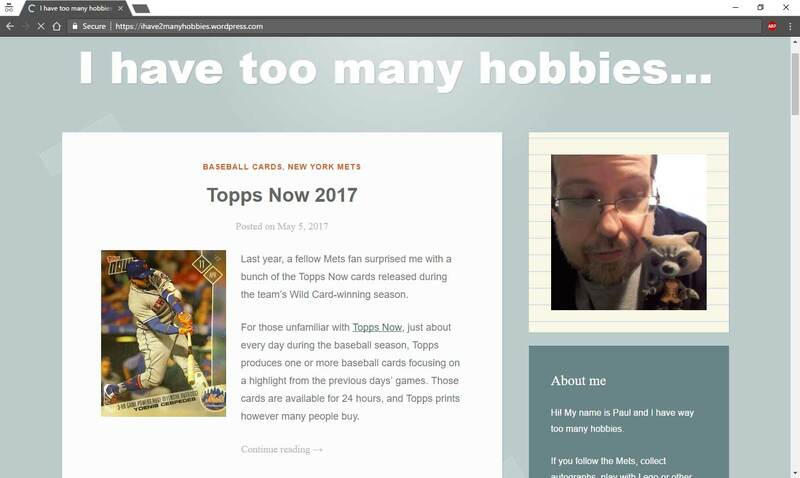 Just putting aside the philosophical argument of turning a card into a wrapper, I don't know if I like the idea of ripping up my own baseball cards ... in my own home ... where there are people who don't understand the whole accumulation of baseball cards thing ... and giving them IDEAS. One simple tear in front of the wrong person, and I might come home to a pile of cardboard carnage. But these are the gimmick times in which we are living. 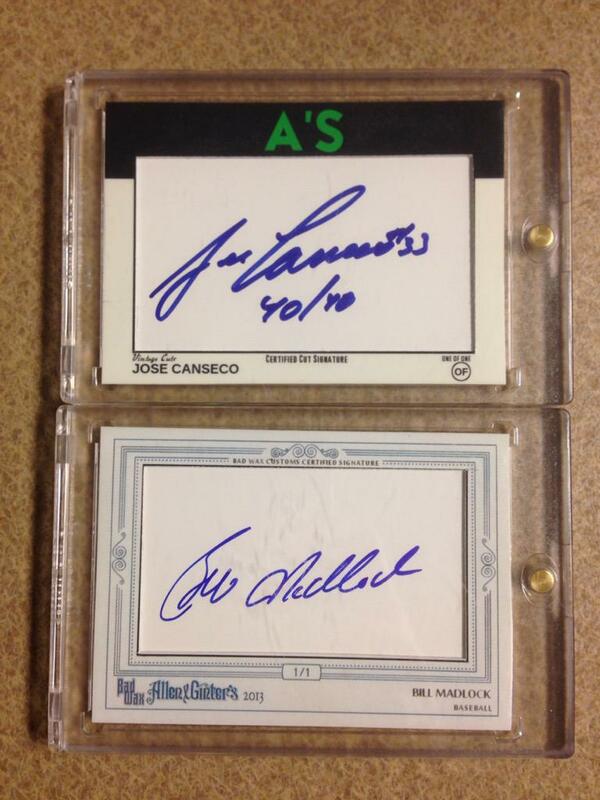 So, anyway, this is one of those double rip cards from 2014 Allen and Ginter. Jereon pulled it, and despite my desperate pleas for him to keep it intact (not really), he ripped it and was instantly punished with a Yankee. That Yankee card was rip card, too, which yielded a mini 1-of-1 Adrian Beltre. Your National League RBI leader is all torn up. That isn't right. So, that was my first "first" from The Dutch Card Guy's sendings. 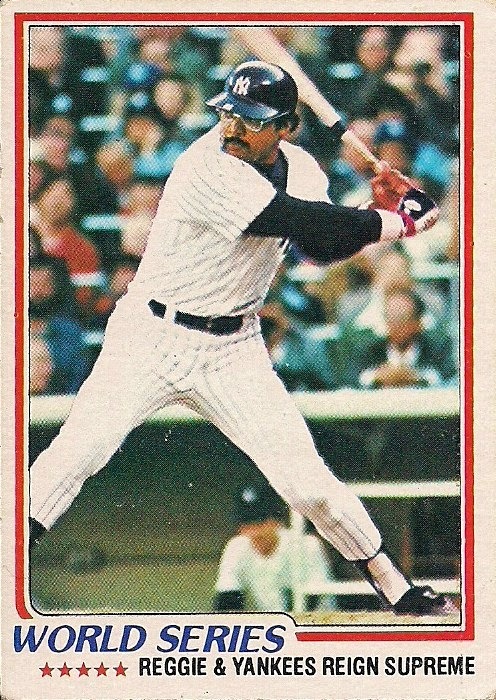 I have other stamped "buyback" cards, but this is the first buyback from the 1975 Topps set in my collection. When Jereon featured this on his blog, I instantly had an idea. 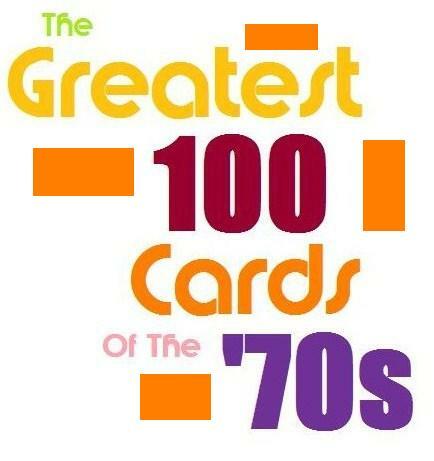 My quest to complete the '75 Topps mini set is winding down (final cards growing mold in my cart because of the whole stupid no money thing), and I've already completed the regular '75 set, but what else is there '75ish? Some have brought up the OPC '75s or graded '75s, but neither of those fit in with the spirit of the first set I ever collected. There are Kellogg's 75s, which may be a possibility someday. But then I thought, how cool to have some buyback '75s? Sure, buybacks are pretty annoying in a lot of ways. I don't want gold stamps on my 1956 Topps. But I've already completed the '75 set. I think I'd like to see how many '75 buybacks I can accumulate. At least the Dodgers, anyway. 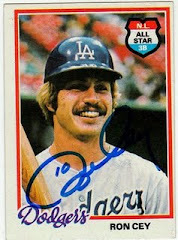 I ESPECIALLY want a '75 Ron Cey buyback card. So if anyone knows how I can work that into my collection, let me know. The rest of the cards that Jereon sent aren't as unique to my collection, but that's not stopping me from accumulating! I suppose I should have determined which one was which before I wrote this post. I'm a bad, bad blogger. T206 doesn't look right with modern players. 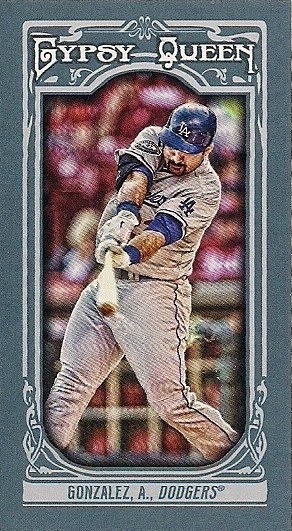 The Russell Martin card is your average Piedmont back variation. 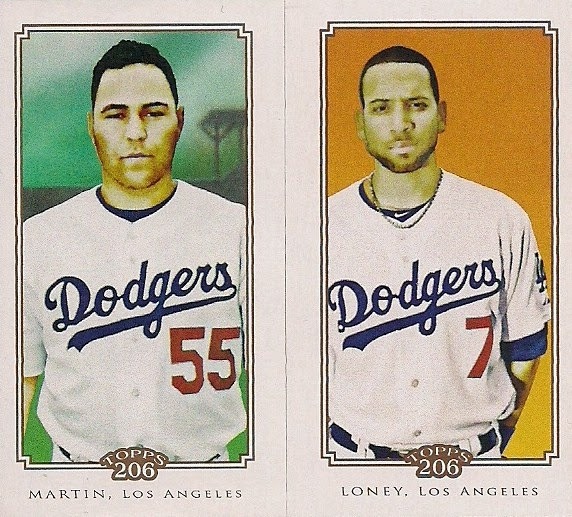 The Loney card is the Caramel variation. But I hope everyone has moved beyond variation backs. In fact, forget I said anything. I have this particular mini already. Since there are just 199 of them, the thought of collecting them all crossed my mind. But I won't do that. 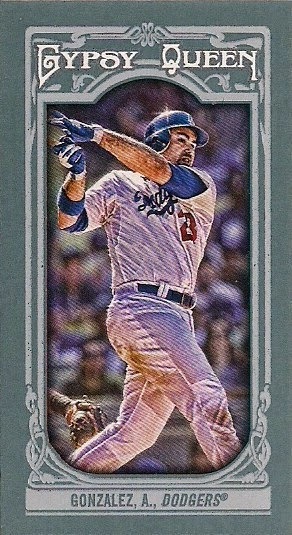 Instead, I'll be happy to trade it to a Dodger collector for any Dodger mini or Allen & Ginter frankenset mini that I need. Back to biggie cards. It's a goldie of yesterday's birthday boy who hit a home run on his birthday. Do you know how difficult that is to do? I've done the same, but that was against some 12 year olds and we were using a tennis ball and launching it over the garage 150 feet away. 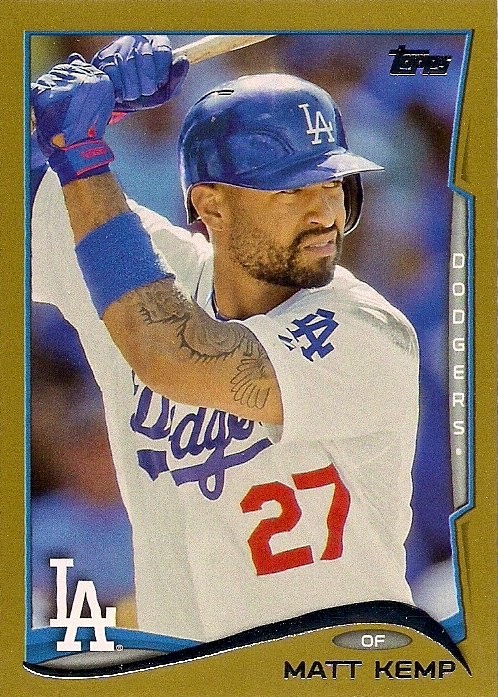 I'm hoping by the time I get home from work, Kemp will have helped the Dodgers clinch the National League West for the 13th time. Thanks, Jereon for some new kinds of cards in my collection. I promise I won't rip any of them up. Today is the first full day of fall. Fall means a lot of things, especially here in the Northeast. Leaves changing (yes, it's already begun), the furnace kicks on (yup, that, too), apple pie (yum) and hockey (I told you, it's the Northeast). But there is really only one true highlight of the fall and that is the World Series. The World Series is the first thing that I think of when someone mentions the fall. And it's appropriate that the primary nickname for the World Series is the "Fall Classic". (This is an example of using the wonderful word "classic" properly. Don't muddy up such a great word by using it to dress up your fly-by-night high school basketball tournament). We're still a number of weeks away from the Fall Classic, but the seasonal change has put me in the mood for the postseason. 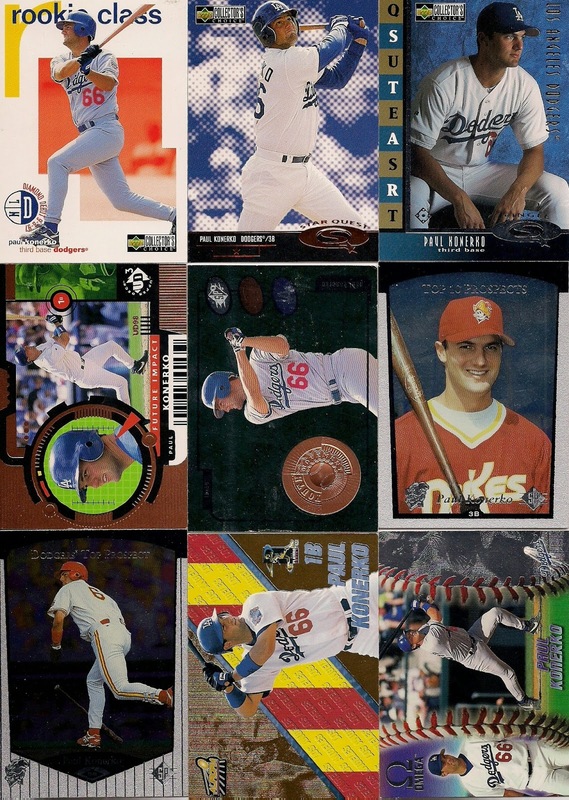 And to prepare for the upcoming festivities, I pulled out 10 classic cards of the Fall Classic. These are all from my collection and they're all from a long time ago. 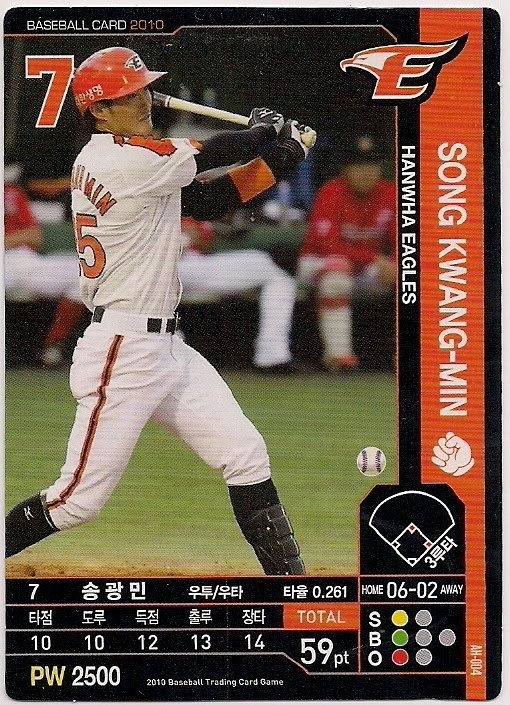 Because a World Series card from 2011 Heritage just wouldn't be classic now would it? 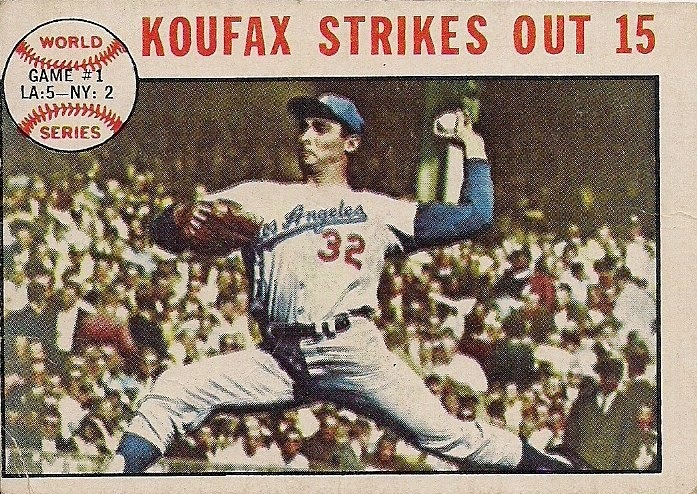 Try to find an action card of Sandy Koufax from his playing career. They barely exist. This is probably the most memorable. It's a beautiful close-up look at Koufax preparing to unleash a pitch against a defenseless Yankee hitter. I have no idea why some people in the stands aren't paying attention. When do you ever see a catcher leaping in the air like he's a shortstop turning a double play? Almost never. Catchers are trained to remain rooted in the ground, the better to field a missile and brace for a locomotive at the same time. This appears to be Manny Sanguillen leap-frogging Frank Robinson, who is sliding in with the winning run in the 10th on a sacrifice fly by Brooks Robinson. 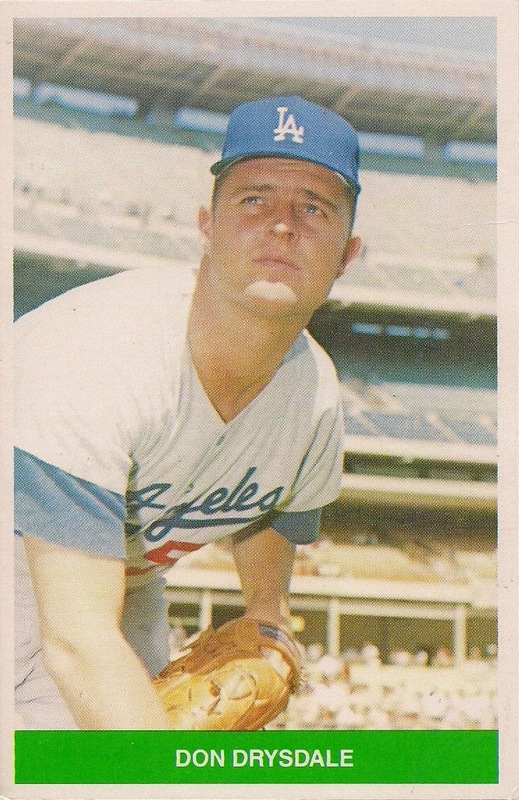 A classic card only to me (and other Dodgers fans). 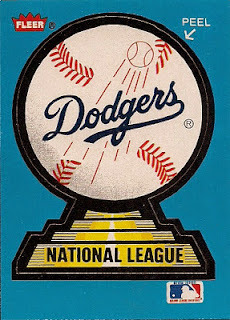 It features the only game the Dodgers won in this World Series. 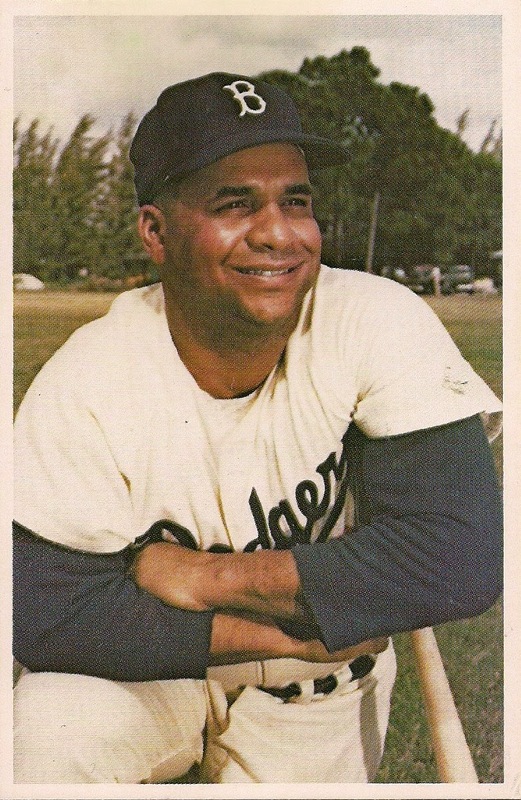 But it is the first time I ever saw a greeting at the dugout on a baseball card. To me, it is the most memorable dugout celebration of all-time. And I've tried to identify everyone in this photo innumerable times since 1975. You have to take the bad with the good when you're a fan. The Dodgers, who mirror life perhaps better than any other team (the peaks and valleys in this team's history are epic), made me realize this at a young age. I hate this card. But, yes, it's a classic. And now I want to cut my fingers off for typing that. 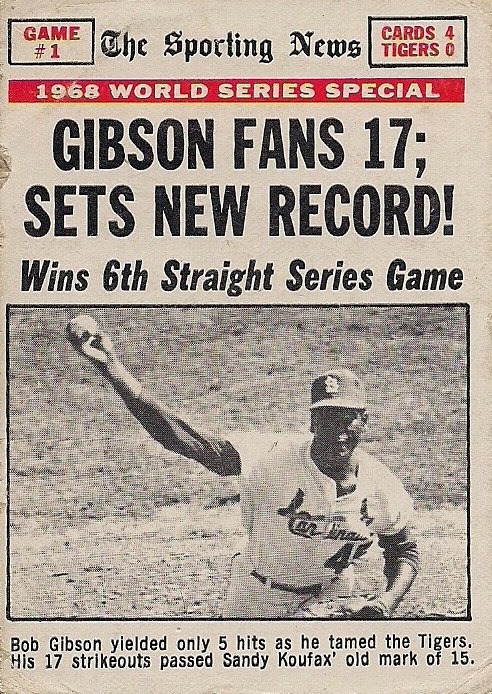 1968 World Series (1969 Topps): Gibson fans 17; sets new record! 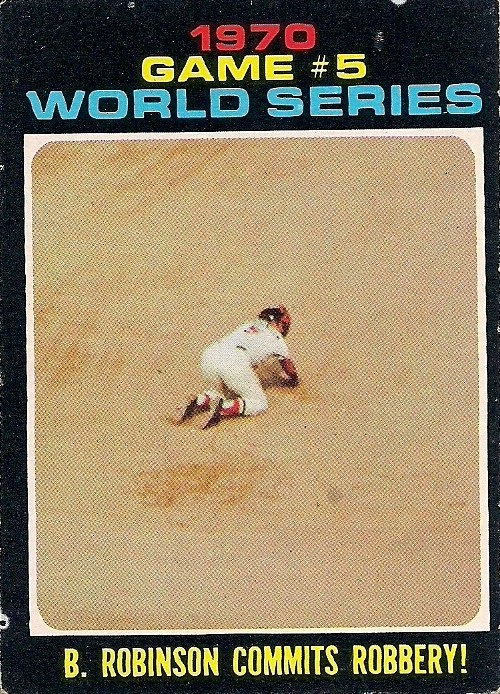 There has never been a World Series subset executed finer than the '68 Series set in 1969 Topps. I've babbled about this before. A near-perfect rendering of Gibson's Game 1 feat to kick off the subset. I would be proud of this layout myself. The card would have been perfect except that every record is new, mr. headline writer. 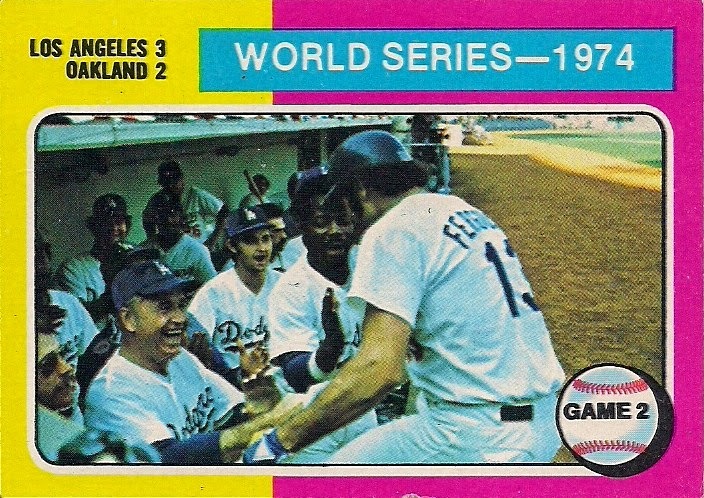 There aren't a lot of World Series cards that capture THE moment of the Series. 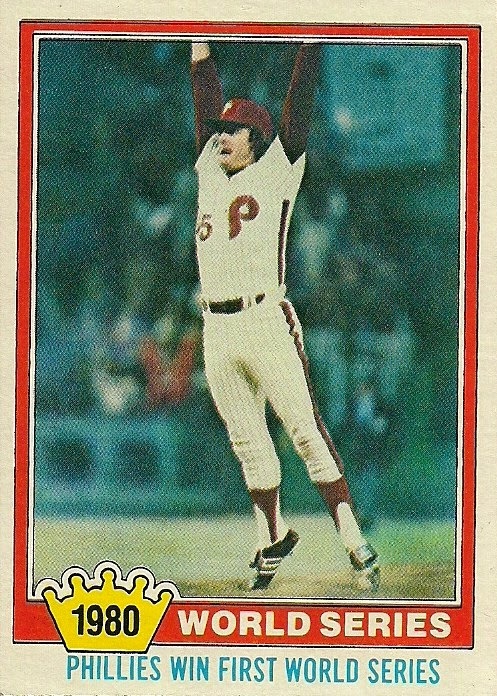 Sure, Tug McGraw's celebration had nothing to do with actually winning the World Series. But it was the moment that you saw over and over when the Phillies won. 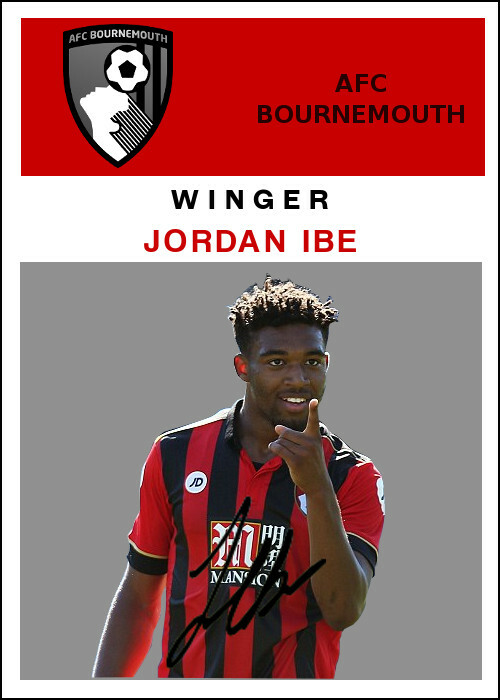 So, good for Topps for capturing this. 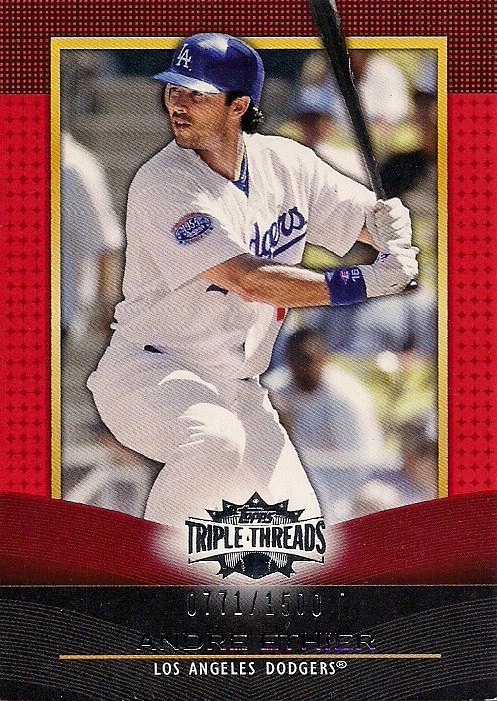 Bad for Topps in that it dropped World Series subsets right after this one and didn't pick them back up for a loooooong time. Beer on a baseball card. Find me another example that is so apparent. 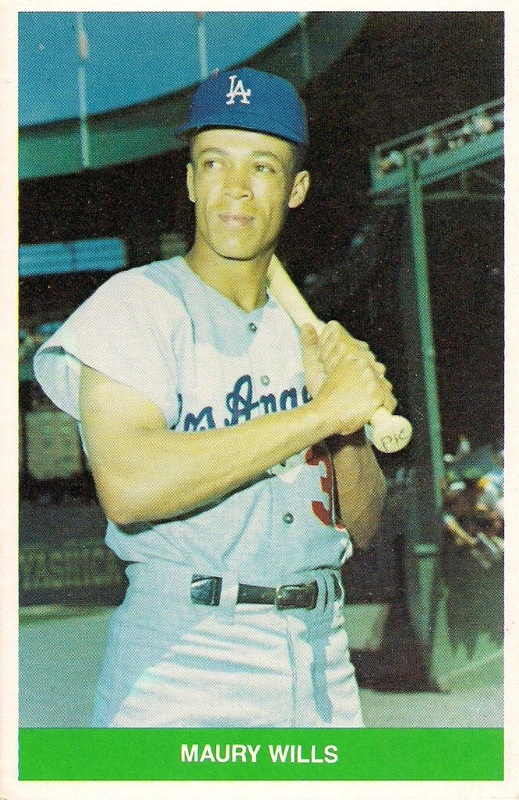 There are few examples of Willie Mays as a Met on a baseball card. 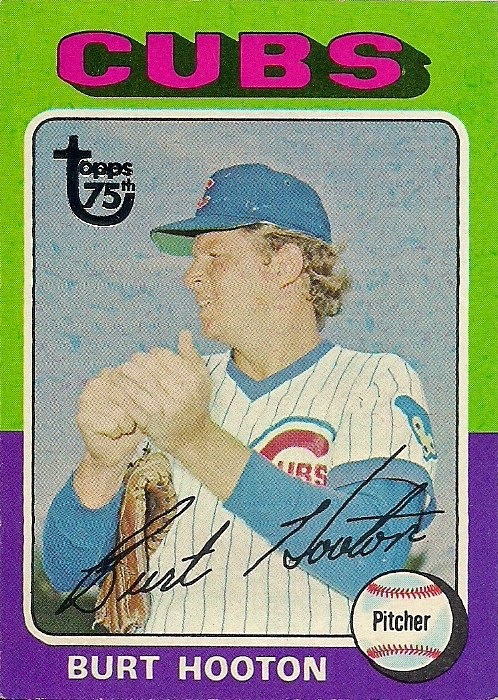 Sure, there's the 1973 Topps base card, but not much else (issued during the '70s anyway). 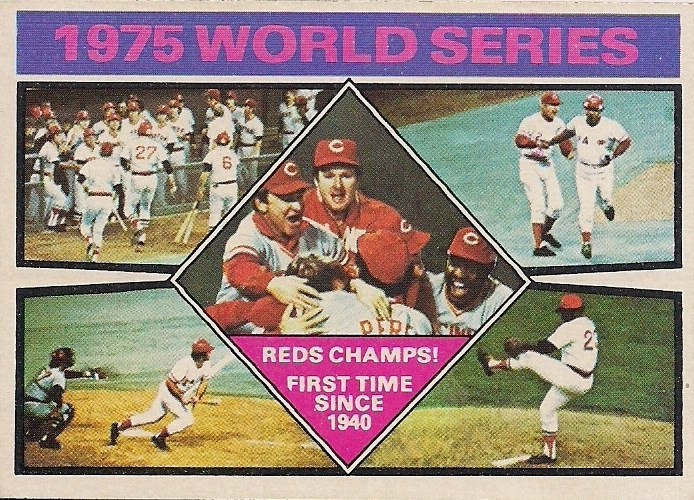 There is a reason why this card will cost you more than just about any other World Series card from the 1970s. 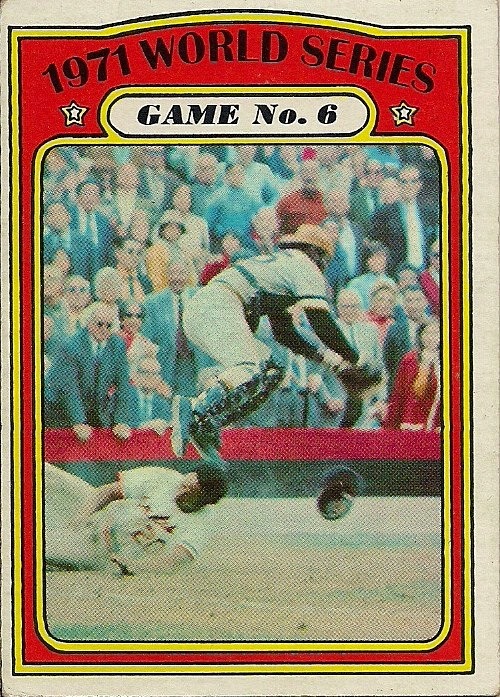 1970 World Series (1971 Topps): B. Robinson commits robbery! 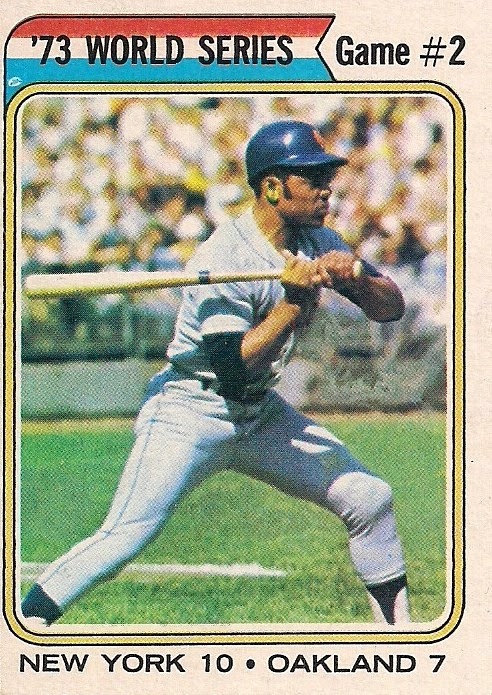 The '71 Topps World Series cards are my favorites. Bright colors on dark frame surrounding an action photo. It's like watching a movie in a darkened theater. And because the action is so far away (and not cropped at all), it's both awe-inspiring and comical. Topps picked a bad time to cut back on its World Series subset. 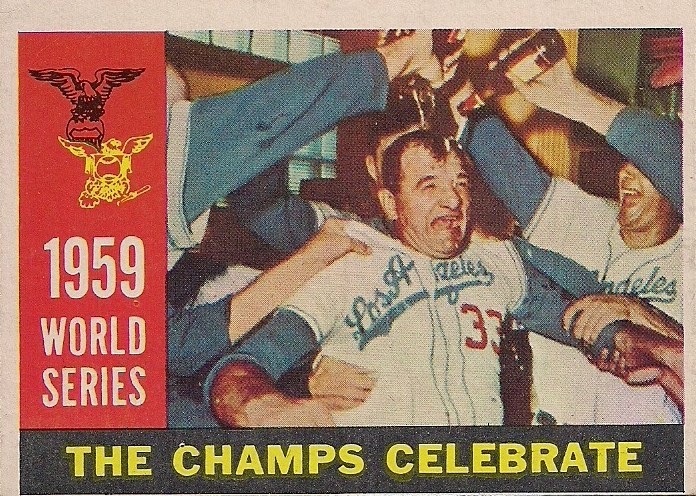 For the first time since 1966, there wasn't an individual card for every World Series game. 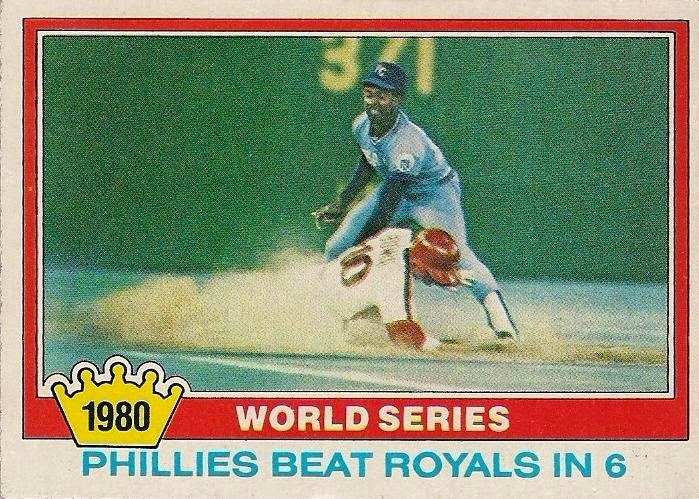 That cost every collector a game-by-game review of one of the most memorable World Series ever played. 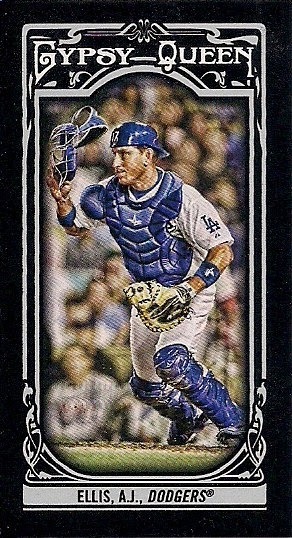 Fortunately, Topps was able to squeeze most of the moments onto one card. That's Carlton Fisk in the top left corner, although not after his Game 6 home run because he practically had the uniform stripped off of him while rounding the bases after that one. That's Tony Perez in the top right corner, hopefully trotting around the bases after hitting a two-run home run off of Bill Lee during Game 7. That's Luis Tiant, at the bottom right, who baffled the Reds in Game 1 with a five-hit shutout. And that's Pete Rose, the World Series MVP, in the bottom left. 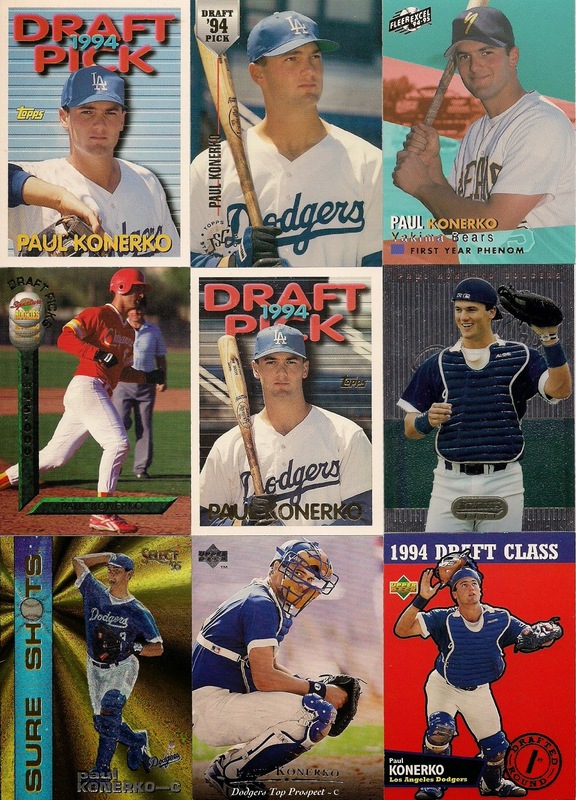 So that's just some of the great World Series cards from a classic time period. 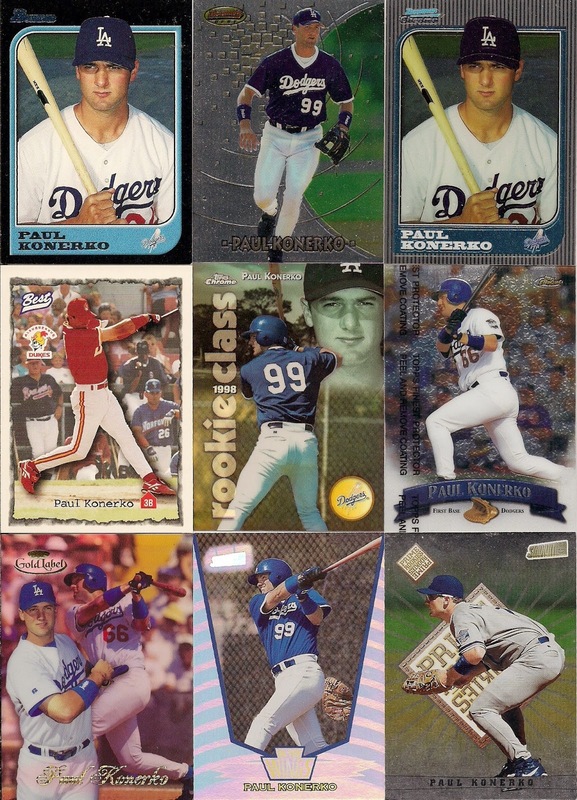 There are even more classic Fall Classic cards that I didn't show here. But I suppose it's time to have yesteryear step aside so the teams of 2014 can make new World Series memories. I'm rooting for Dodgers vs. Orioles. Somebody needs to get payback for 1966.